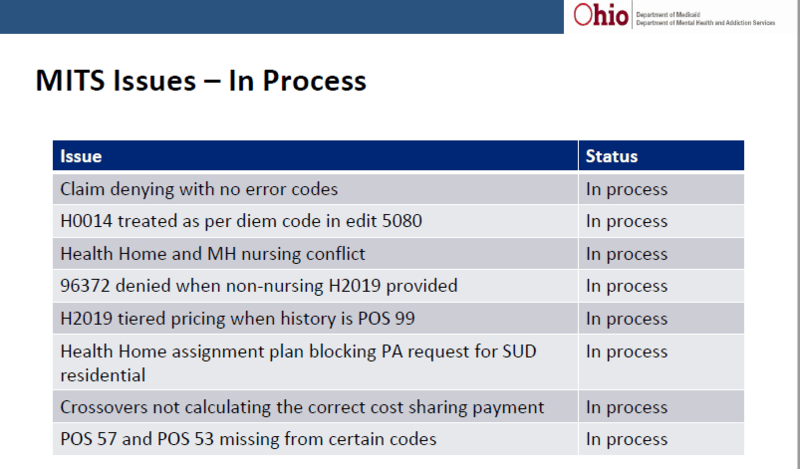 Common Billing issues and more critical information about the Ohio BH Redesign. A number of issues were discussed at the brief EDI meeting held at Ohio Medicaid this week. The full slide deck is available here. Some of the important items to take note of is there are several issues Medicaid has already resolved during the adjudication process and multiple items are still pending. 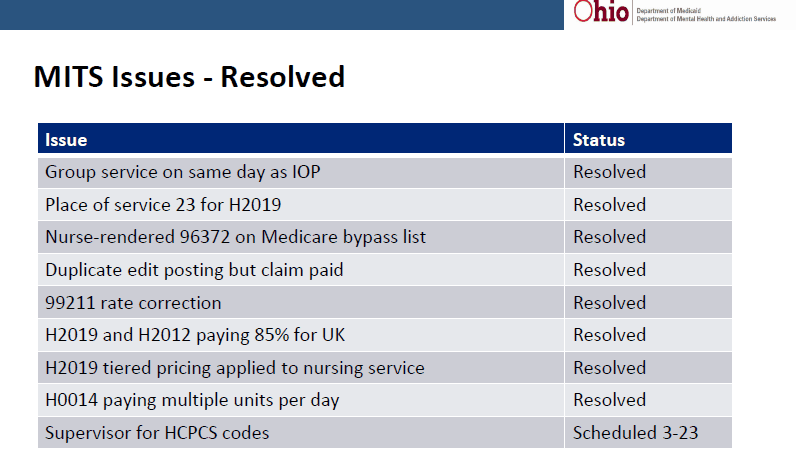 Below are the items resolved by Medicaid. Several important issues are still pending resolution by Medicaid. In addition, we are still waiting for official guidance on how the process of dual certified providers, dependent or unlicensed, will be required by the state to be processed. To date, there is minimal participation in the process to have a provider set up as able to provide MH and SUD services, although this is very common in most agency’s. 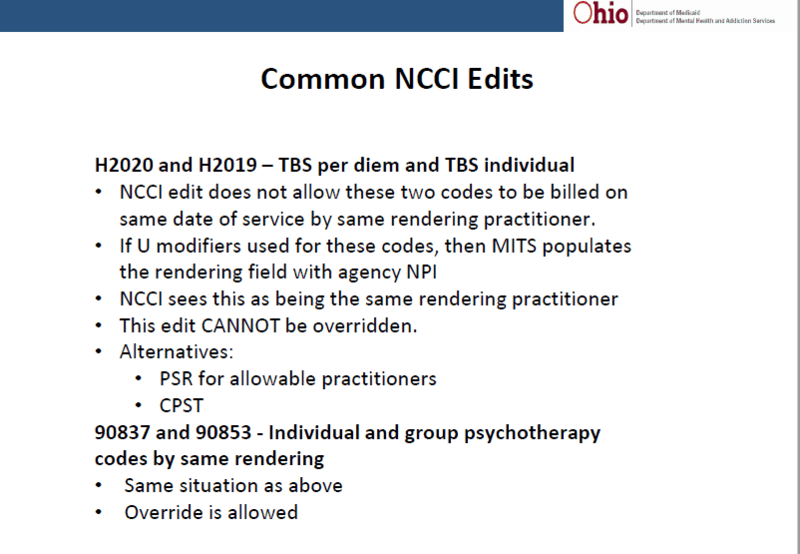 One common question we receive at BHBS is regarding NCII Edits. Edits listed in the current rate workbook are listed here. There are a number of known services that cannot be provided on the same day with other services. In addition, there are some services not on the list provided by the state that will also cause an NCII edit. Below are some additional NCII edits specifically addressed by Medicaid. 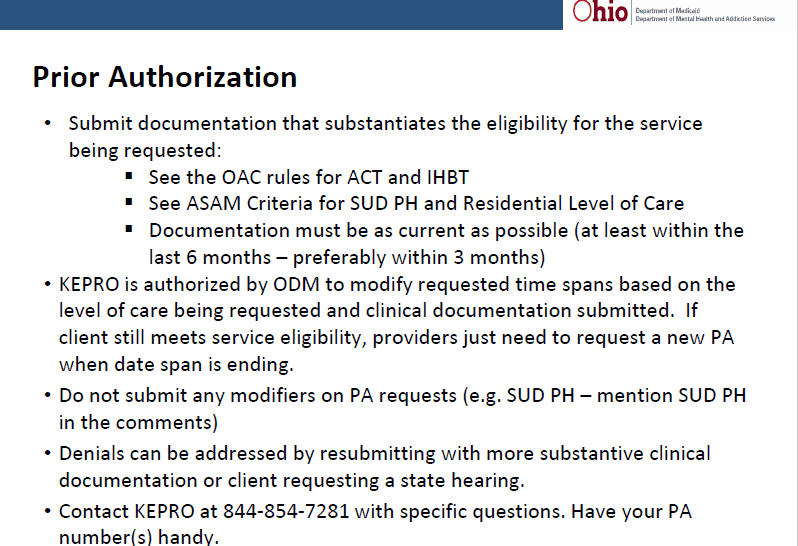 Medicaid also presented information and guidance related to obtaining Prior Authorizations. Behavioral Health Billing Solutions is also trying to verify additional information that requires same day input of prior authorizations in order to get all days of service covered. All PA’s must be submitted the day of admission, with or without uploading documentation. The agency then has 30 days to upload the supporting documentation into the portal. In addition, it’s critical to stress that modifier’s should not be entered into the modifier field’s on the PA request. The level of care and modifier’s should be entered into the notes or the required licensure modifiers could cause the claims to deny. Finally, the state released a MITS BITS updating providers on the rules related to services provided to client’s receiving SUD Residential Services. The complete MITS BITS is available here. Specifically this speaks to what is included in SUD Residential Services and what alternative’s agency’s has for disputing a denied claim. The Medicaid form mentioned above (form 06653) and in the MITS BITS can be found here. Our recommendation, as always, is to know the rules and your rights as a Behavioral Health Agency in Ohio.